Rydges Hobart offers 4 star boutique hotel accomodation where the charm and grace of the old is in harmony with the polish of the new. 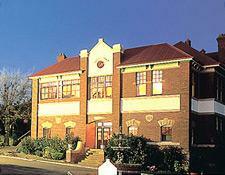 Rydges Hobart?s heritage listed buildings and antique suites capture the essence of historic Hobart. This very special hotel is quietly sophisticated and imbued with a warmth and intimacy that only a small boutique accomodation property can offer. Rydges Hobart features excellent facilities to suite all guest's travel requirements such as high speed wireless and wired internet, outdoor swimming pool, sauna, licensed restaurant, bar and cafe, eight ball table, Austar in all suites and apartments, 24 hour reception and FREE parking. All types of travellers can take advantage of the discount accommodation at the Rydges Hobart, as well as the range of modern amenities including lounge bar, business centre, conference centre, free car parking, guest laundry, restaurant, room service, outdoor swimming pool, tour desk, bbq and 24 hour reception. Accomodation is non smoking, however suites with external access can be allocated for guests wishing to smoke (please specify requiirement when booking). Offering a lush garden setting, and genuine, enthusiastic service only minutes from the Hobart CBD, the Rydges Hobart provides the perfect base for exploring this city's spectacular sights. Mt Wellington, the Huon Valley, and Constitution Dock are just a few of the many attractions on offer in Southern Tasmania. . Nearby Attractions : Visit the Salamanca Market every Saturday located on the water front in Hobart, approximately 2.5km from Rydges, The Cadbury's Chocolate Factory is open every Mon-Fri located in Claremont which is approximately 30 minutes drive from Hobart, Richmond is a great half day tour for everyone, Cascade Brewery Tours if you are a lover of Tasmanian Cascade Beer and other beverages, Mt Wellington for the most amazing panoramic view of Hobart, Enjoy a cruise tour with a difference on the Derwent River, Travel to the Huon Valley 40 minutes from Hobart for a taste of the beautiful Tasmanian scenery by walking through the tree tops at the Tahune Airwalk, Spend the day on Bruny Island exploring the beautiful native forests and meeting the friendly locals. Antique Queen Suite : Sleeps up to 3 guests on 1 Queen Bed + 1 Rollaway Extra. Manor Suite : Sleeps up to 4 guests on 1 King Bed, Or 2 King Single Beds + 1 Queen Murphy Bed. Superior Twin Suite : Sleeps up to 4 guests on 2 King Single Beds + 1 Queen Murphy Bed.